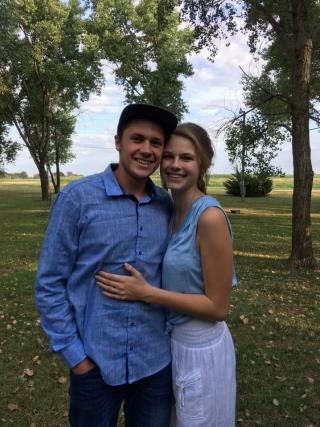 (Newser) – The greatest joy followed by the deepest sorrow: A Saturday car crash claimed the lives of Austin Wesson and Rebekah Bouma in Clearwater, Kansas. The 19-year-olds had been married the day prior. The Wichita Eagle describes theirs as a whirlwind romance: The two met while on mission trips in Wesson's native South Africa in February, and were engaged by June. Bouma's mother, Rachel Bouma, says the two married in a courthouse ceremony Friday that was conducted with Wesson's immigration status in mind; a wedding celebration, with Wesson's South African relatives present, had been planned for next month. The couple intended to move to Grand Rapids, Michigan, for college. It was very sad for anyone to get killed especially so soon after their wedding. I hope they were able to consummate their marriage. Sometimes young married couples take their mind off the road. It still is very sad. Praying for the families involved. Bad things happen to those that try to circumvent the law! On the upside, they spared themselves future divorce costs.